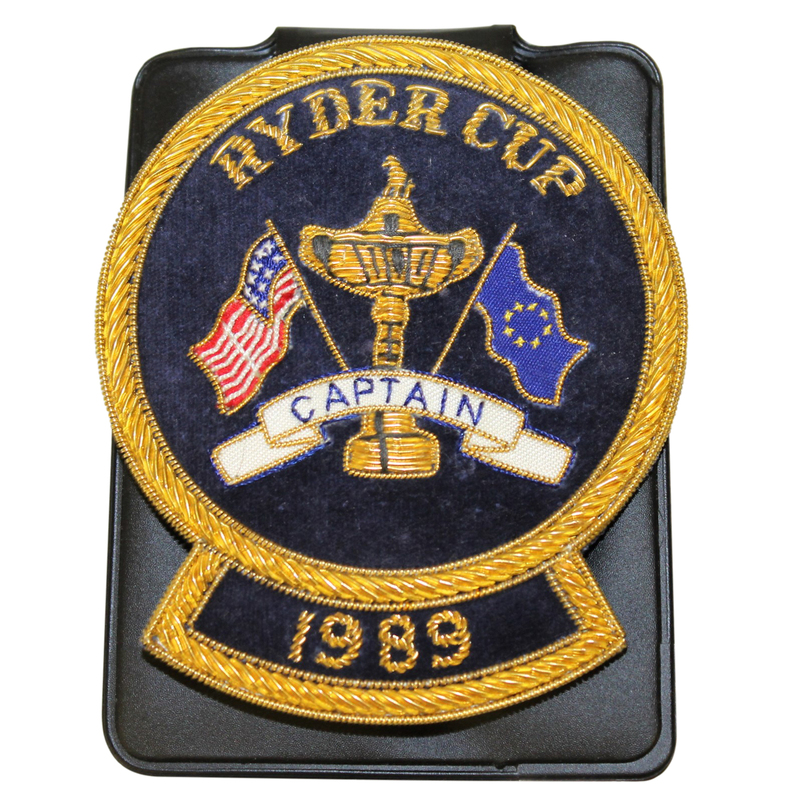 Ray Floyd was the United States team captain at the 1989 Ryder Cup matches, and offered here is his team issued "Team Captain" pocket crest. Comprised in stunning bullion fringed construction which has been hand crafted, employing metal threads in gold against a suede background. The crest displays the flags of the two competing nations, an image of the prized Cup so named for it's original presenter, and scroll bearing the script reserved solely for Ray Floyd on the U.S. squad 'Captain'. 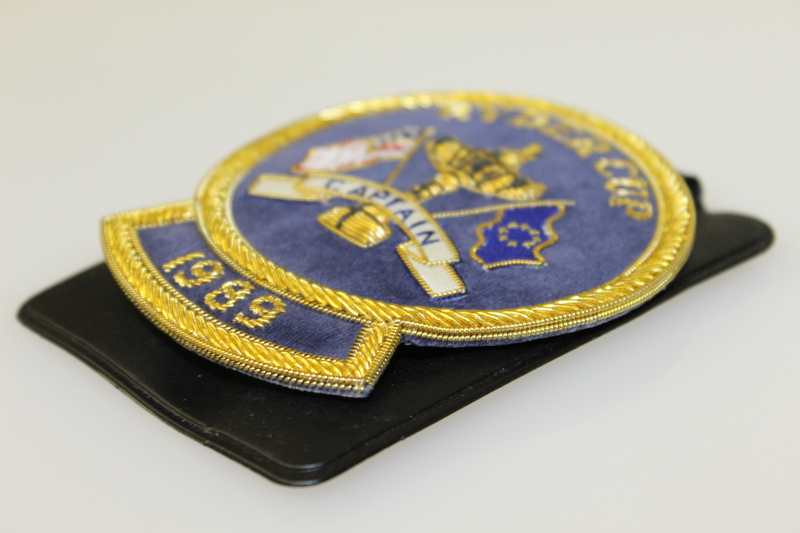 The 1989 Ryder Cup participants displayed these crests on their blazers before, during and after the Champions Dinner as has been the tradition over the events rich history. The 1989 Ryder Cup matches at The Belfry saw just the second ever tie, each team earning 14 points. The European team retained the cup, having been the winners in 1987. Ryder Cup participants crests have occasionally reached the market place. 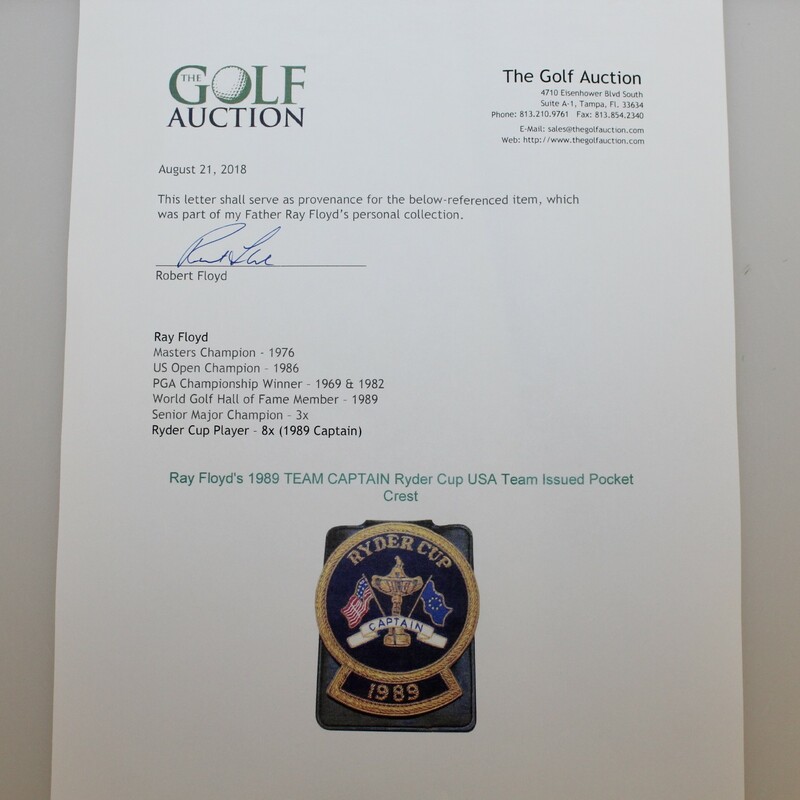 The opportunity to obtain a crest from a Team Captain is a seldom scene occurrence, of most recent note when a similar item from Sam Snead's 1969 captaincy sold for in December of 2013. Letter of provenance on this item from son Robert Floyd. The Golf Auction is proud to have a client in Robert Floyd which led to Ray Floyd agreeing to part with some of the prized items from his Hall of Fame career. 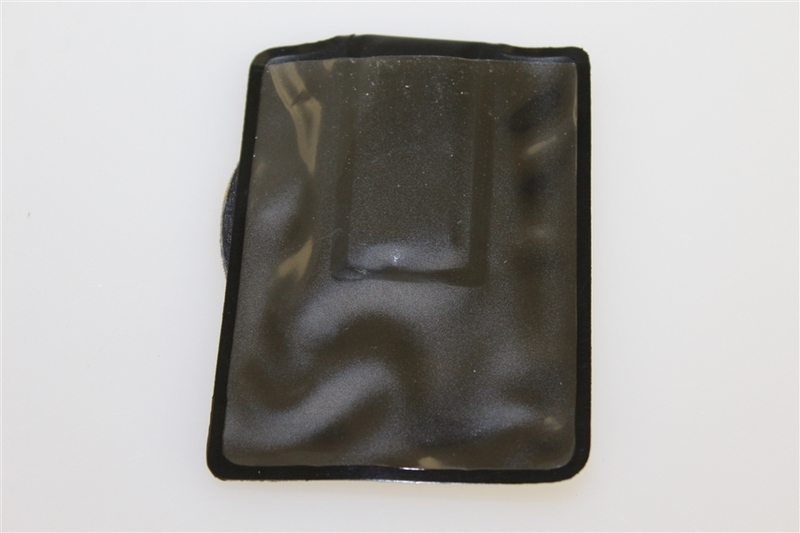 It is even more special in light of the loss of many of Ray's early career mementos to a family home fire in 1992. It should be noted that Robert is an accomplished golfer in his own right. He was chosen by the American Junior Golf Association as co-player of the year for 1994, and was a semi-finalist in the U.S. 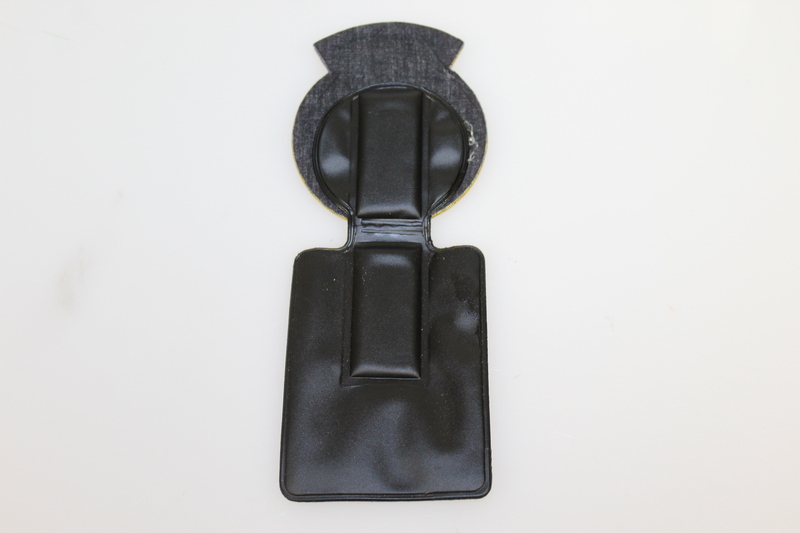 Amateur. He paired with Dudley Hart to win the pro-am at the 1994 AT&T Pebble Beach National Pro-Am and became a two-time All-American at the University of Florida in 1996 and 1997. He played in 23 PGA Tour events from 1994 to 2009 making two cuts. In 2008, he was one shot out of the lead at Pebble Beach, but he shot 74-76 on the weekend to tie for 48th place and pick up $15,264 - his largest purse on the PGA Tour. Teamed with father, Ray, to win Champions Tour's Father/Son Challenge in both 2000 and 2001.